Now it's your turn to overthink things! I used 100 words when 10 would do; it's all just a bit of a laugh, isn't it? While we're in Carry-On territory, I thought Nausea's line about Casey's tolerance for dead fluids after their three-way was hilarious downstairs talk, but I'm reliably informed that's probably not the case. It's all about microbitotics, dead microbiotics. Another great prog. To reflect this I'm going to make every strip joint TOP THRILL. Yes, even Skip Tracer. Maybe we're in for another 'Trifecta'..? There's an interesting tail on Page 10 of prog 2083.. I will give Skip Tracer time to develop (maybe some patience required), so far I like the story. Relax mate - why don't you sit down with a nice cuppa and a Garibaldi? What's the point of that? Can't dunk a garibaldi in a cuppa. Don't normally do brands, but milk chocolate hob nobs are the perfect accompaniment to a cup of hot brown beverage (tea, hot chocolate or coffee, your choice). That thought crossed my mind when the last panel of Skip Tracer showed The Underneath with pipes and a boiler room vibe while the first panel of Survival Geeks showed backstage at the convention, with pipes and a boiler room vibe. 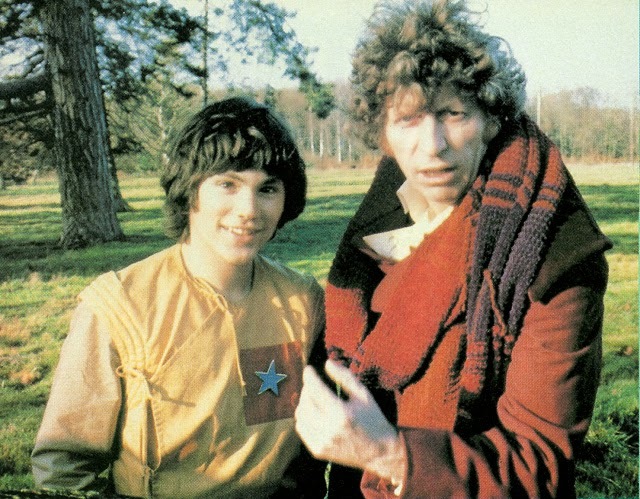 Not to forget Adric, of course! Oh yeah, forgot to mention those. The one of Tegan is especially wonderful. It actually took me a little longer than the others to get Tegan - then I remembered she was on her way to work as an air hostess - surprised at how closely the pic of her in the uniform resembled! She spent the whole of Peter Davison's first season in that outfit. Must have been a bit ripe by the end. In an alternate reality, probably one where President Boone was the last president of Amerika, Tharg phoned Kendall and had him work that panel up into Cover Of The Year 2018. So many individual panels are masterpieces in miniature, but go unappreciated because the artist prioritised storytelling over showboating. It's good to highlight moments where an artist's obviously touched on something that really resonates with him; Ancient and Malevolent are the first blocks in Kendall's custom colour palette. Kek-W haps psertainly pstruck upon a psuitably dipstinctive psignature pstyle of pspeech for psi characterps, although the temptation to overdo it ips obvioupsly irrepsipstible. Pspeaking of alternate realities, I can see why two lefties couldn't pass up the opportunity to depict Melania bludgeoning Trump to death in the Kremlin, but if we're to understand Deadworld as a mirror universe of Dredd Alpha, wouldn't it have been more interesting to have Clinton win the election (rather than the popular vote)? Booth/Boone as Trump and the 2016 (or 2020) election already don't quite fit into the timeline, but throwing Kazan and the Apocalypse War (2104) onto the bonfire really emphasises Nigel's not playing a Long game. Nobody's meticulously planned out how this is all going to fit into an alternate history of MC1, like Alan Moore with his roll of butcher paper or Jon Osterman with his watch parts. Speaking of colour, alluding to Ezquerra's colour aesthetic for his two least lovely female character creations is a lovely touch. Which is fine. It's interesting to mark the distinction, though. I sometimes find what you write about the prog more interesting than the actual prog itself...(naming no, Survival Geeks, strips in particular). Except for those of us who are allergic to chocolate! I really like milk chocolate bars, but there's something about plain chocolate on a digestive (or even biscuits in general) that just works! Prog: All pretty good, but think Durham Red and Deadwood were the highlights, although I'm a little lost with the latter. Best read as a collection, I think. Or I'm just getting old.